Many webmasters and web marketers have been sleeping on Bing for the last few months. However, Bing has shaken the game up considerably thus far in June. In no more than 7 days, Bing has launched 3 significant updates. Let us review. Less than a month after Google launched its Knowledge Graph snippets, Bing has replied by incorporating informational snippets from the Encyclopedia Britannica directly into their search results page. Introduced by Bing on June 7, the new feature is dubbed Britannica Online Encyclopedia Answers and is triggered by searches for certain people, places and things. Certainly, Britannica Online Encyclopedia Answers does not exhibit the power and scope of Google’s Knowledge Graph, as the Bing feature affect less queries and taps into a smaller base of knowledge. On the other hand, information from Encyclopedia Britannica is more credible than Wikipedia and Freebase, two main sources of data powering Google’s Knowledge Graph. Further, the move shows that Bing is also evolving its search capabilities beyond merely matching pages with search terms to provide relevant information directly on the search results page by understanding how pieces of information relate to each other. One day prior, on June 6, Bing announced the addition of a slew of ridiculously helpful features to Bing Webmaster Tools. Dubbed the “Phoenix Update”, this group of improvements effectively upgrades Bing Webmaster Tools from an “interesting” tool to an essential part of the SEO and website analysis toolkit. Keyword Research: Ever wish a search engine would share stats on their search query volume based on organic search statistics? Well Bing Webmaster Tools launched a keyword tool in March that does just that; and now the tool can examine batches of multiple keywords. I remain a fan of Google AdWords Keyword Tool, but I’m glad to have another free keyword tool this useful. SEO Analyzer & SEO Reports: BWT now enables you to examine any web page you own for SEO best practices. We’re talking not just finding missing or duplicate title tags. We’re talking pointing out failures for using 15 best practices including Meta description tags, alt attribute, h1 headers, URL parameters, and more. And you can even find where in the source code the issue is. Even better is the fact that BWT can run regular biweekly reports on your entire site to diagnose best practice violations. Sweet. Link Explorer: Remember Yahoo Site Explorer? Well, it’s like Yahoo Site Explorer has risen from the ashes, because, like Yahoo Site Explorer, the new Link Explorer enables users to examine huge lists of backlinks for any URL for which there is data. And Link Explorer even takes it a step further: you can filter backlinks by anchor text and on-page content. Whoa. There’s literally too much awesome for me to go into full detail, so, if you haven’t already, do yourself a favor and check out Bing Webmaster Tools as soon as you can. It’s powerful, free, and easy-to-setup — so you have no excuses. The announcement of the Phoenix Update might be the best industry news I’ve heard yet this year. It really appears that Bing has actually made a big effort to understand the needs of webmasters and SEOs and truly wants to give us tools to do better SEO. The idea of mingling search engines and social networks isn’t new — both Bing and Google have been taking social media users’ opinions of websites into account for a while now, and Google integrated social media with search with Search plus Your World all the way back in January. Also not new is the concept of Bing joining forces with Facebook, as Bing formed an alliance with Facebook way back in 2010. What is new is the marrying of social and search in a way that actually enhances the user experience in a meaningful way. When Bing launched the new version of Bing on June 1st, it finally scored a meaningful victory over Google. Google’s integration of its own social network Google+ into its search engine may have been intriguing to SEOs, but it didn’t make much of a splash on users, because few people actually use Google+ regularly. On the other hand, the new Bing really ups the ante on Social Search by unobtrusively but effectively integrating the Bing Social Sidebar into search. The new sidebar adds to queries relevant information from users’ Facebook networks and popular public information from other social media (like Twitter and… Google+). Bing has given social search its best functional improvements yet, and is investing a lot of marketing dollars in making sure everyone knows it. Whether or not Bing can turn its functional improvements into improvements in profit remains to be seen. Indeed, Bing has yet to see a profit. In fact, Bing’s fiscal outlook had gotten poor enough to fuel rumors that Microsoft was interested in selling Bing off. Some web professionals who think that Bing is unworthy of their attention might point out that less than 15% of U.S. searches are done on Bing. However, I’d rebut that, since Bing powers Yahoo, Bing now powers 30% of all searches, improving its share slowly by steadily. 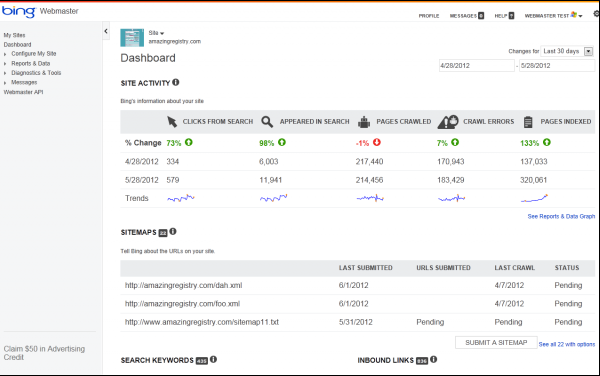 Further, the recent amount of activity being dedicated to improving Bing demonstrates Microsoft’s commitment to search. While Bing certainly doesn’t look poised to overtake Google in market share anytime soon, it has proven itself to be a formidable force. Bing’s innovation in Bing Webmaster Tools and social search show that Bing is a major driving force in furthering web innovation. Ignore Bing at your own peril. Bing certainly has gotten my attention. And respect.